Buy Factory Direct from MHE. 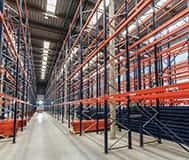 We manufacture New Pallet Racking & Cantilever Racking systems just south of Indianapolis in our state of the art 530,000 square foot manufacturing facility. 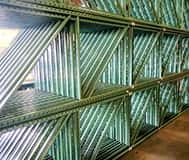 We carry hundreds of sections of used and new Cantilever Racks of all sizes. Cantilever racks are great for storing long and bulky items like wood and pipes. Over 100,000 new and used Pallet Racking Beams in-stock and ready to ship. 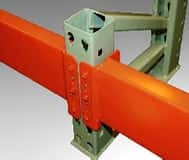 Call today for a pallet rack beam quote now! Over 15,000 Pallet Rack Uprights of all sizes and in doors! Call today for a quote and we would be happy to assist you with your warehouse. We are the leading used equipment retailer in the nation. 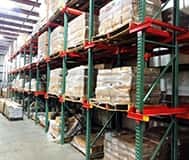 Tens of Thousands of high quality used pallet rack uprights and beams in-stock at any one time. Material Handling Exchange Starter and Adder kits are an easy way to set up a run of pallet rack without having to choose individual pieces. 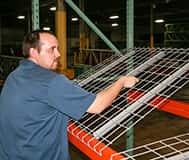 Wire Decks are used within a pallet rack system to allow small packages to be stored and/or for preventing pallets from falling between pallet rack beams when the pallets are being placed on and taken off the beam levels. MHE Specializes in “Used” Pushback Pallet Racks. We have the largest “Like New” PushBack inventory to handle all your inventory management systems! Material Handing Exchange manufactures new Drive-In Pallet Rack at incredible low prices per pallet position. We also carry a large selection of used racking. Take a look! We have professionals on staff to handle your projects from start to finish. We offer complete warehouse layout drawings and design, along with handling any permitting issues from start to finish. We can offer you trade-in allowance or a straight buyout on any quality used equipment you made need to get rid of. We pride ourselves on being a one-stop shop for all of your storage and handling needs. We pay CASH for equipment. We will remove equipment & leave your warehouse broom swept with anchors sheered flush with the floor. 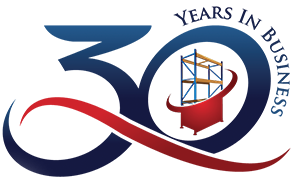 We specialize in Pallet Racking, Conveyors, & all other Material Handling Equipment. Who is Material Handling Exchange Inc.? We are a team of dedicated and knowledgeable professionals specializing in the set up and design of all types of warehouse storage and handling systems. Material Handling Exchange (MHE) opened its doors in 1989, working out of a small 3500 square foot warehouse. We have grown to over 500,000 square feet of warehouse space full of everything you could ever need for your storage applications. 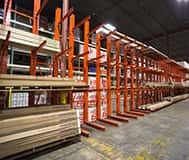 Our specialty is used pallet rack beams & uprights, and complete design and installation of racking systems of all types. In the beginning, our primary focus was the acquisition of used pallet racks. We would scour the country looking for companies that were closing down, consolidating, upsizing, you name it. 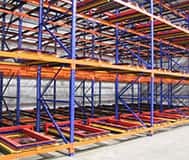 Because pallet racks are made from steel, unless they have been damaged by a forklift, they are just as good 10 years down the road as they were the day they were new. Our goal was and still is to have the largest selection in the nation to offer our customers. When we are acquiring our used material handling equipment packages we run across just about anything you would ever see in a warehouse storage and distribution environment. These items range from used forklifts, used stretch wrap machines, used gravity conveyor and in some cases complete used conveyor systems. Because of our buying power, we are able to negotiate the best deals when acquiring used equipment, which means those savings can be passed on to our customers. We have saved our clients throughout the years Millions of dollars by providing them top quality used equipment at a fraction of the cost of new. If you are looking for something for your warehouse, most likely we’ll have what you need in stock or it maybe coming in soon from a recently used package acquisition. We have grown to be one of the largest used material handling equipment dealers in the Midwest, if not the country. Although our specialty was used equipment, we came to realize that there are applications where we simply couldn’t satisfy certain requirements of our customers. Whether this meant we couldn’t find the right size setup or the customer simply had to buy new, we found it necessary to create a solution to this problem. Although the solution wasn’t simple, we began the process of setting up our newest operation dedicated to building New Pallet Racking and Cantilever Racking. We are proud to announce that our new manufacturing operation is continually growing. MHE can now offer our clients factory direct pricing on their pallet or cantilever rack systems. Whether you need standard tear drop style, drive-in racks, push-back racks, flow racks, or cantilever racks. We’ve got you covered. 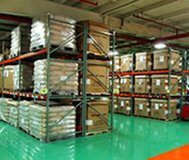 Many of our clients benefit from a combination of new & used pallet racking products. In a case where we don’t have the exact size of uprights they may need, we simply build them. If we don’t have the exact beams they need but have used uprights that will work, we build the beams. The addition of our new products have given us flexibility in our industry that simply put, nobody else has. Being located in Indianapolis also gives our clients a big freight savings. We are very fortunate to be able to operate is what is considered the crossroads of America, which affords us a very competitive edge when it comes to our low freight costs compared to our competition.